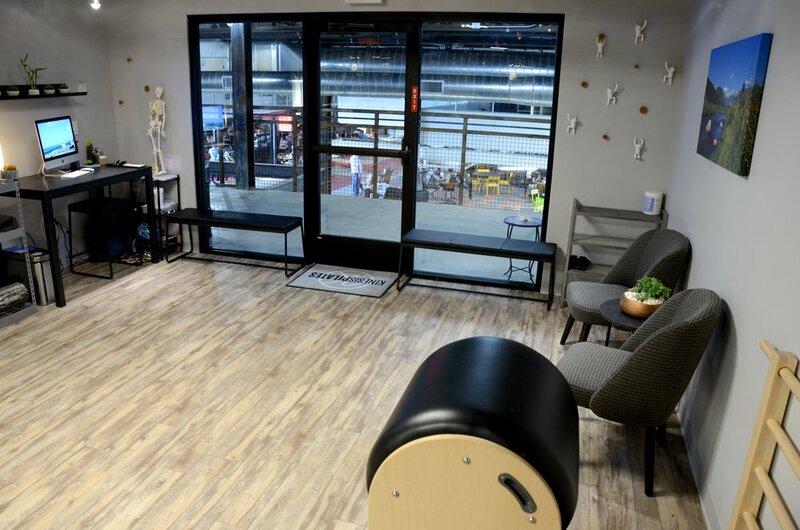 Kinesis Pilates is located on the second floor of The Stanley Marketplace at 2501 Dallas Street, Aurora. 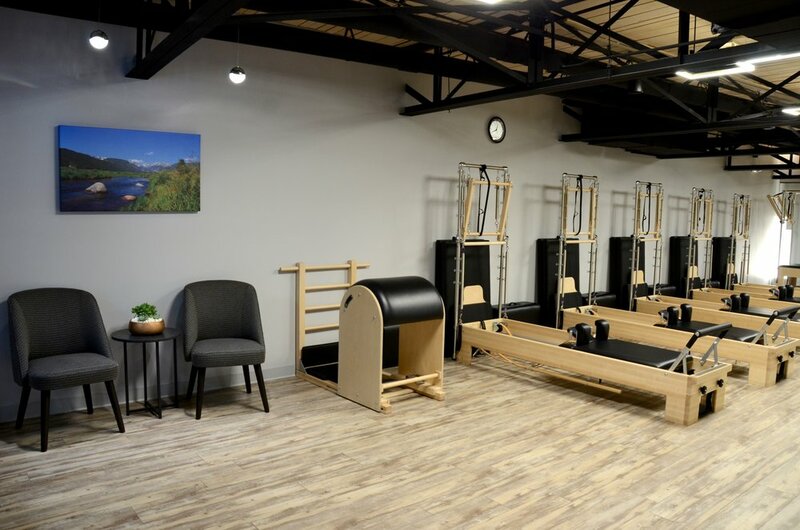 The 850-square foot studio has five Centerline reformers that convert into towers, five chairs, one cadillac, one high barrel, and various other smaller equipment. For more photos and information about Pilates equipment, please continue reading below. 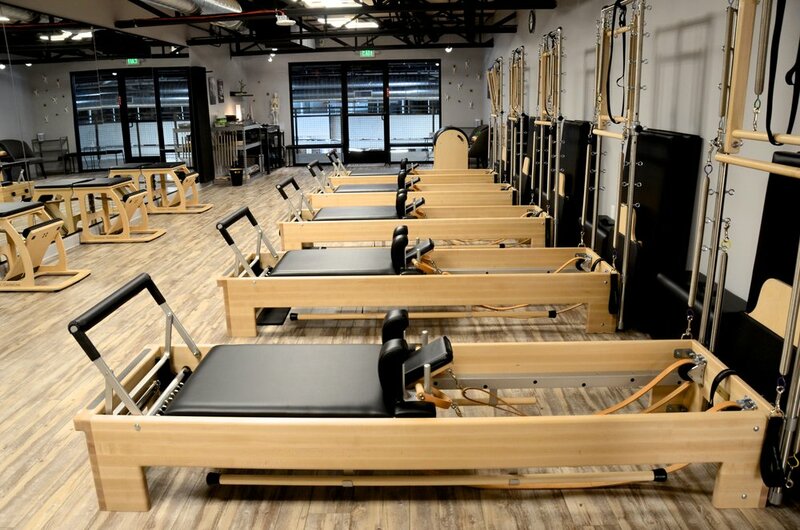 Probably the best well known piece of equipment is the reformer. It is comprised of a wooden frame, carriage on wheels, a foot bar, shoulder blocks, an adjustable head rest, and five springs to vary the tension. The Centerline reformer is incredibly smooth and well padded. The kickstand on the footbar allows for quick, easy transitions. Joe also designed a piece of equipment called the cadillac, a table with a cushioned mat and four poles extending from each corner and connecting in parallel bars above. A variety of pieces are attached to the poles, including leg springs, a roll down bar on springs, and a wooden push through bar that can be spring loaded. A lighter version was later created called either the tower or pole. Towers have two poles extending from one end of the equipment only, allowing for most exercises done on the cadillac to be completed. The five reformers at Kinesis convert into a towers, and there is also one cadillac. The most compact piece of equipment able to work the whole body is the chair. This is one of my favorites. The Centerline chair has a paddle that can be loaded with two springs on a cactus design to allow for eight variations of resistance. Joe designed several barrels, including the high barrel (sometimes called the ladder barrel), spine corrector, and small barrel. All three provide excellent support for the spine in extension. In addition to his larger pieces, Joe also created smaller equipment, such as the Ped-o-Pul, foot corrector, toe gizmo, and magic circle. There is almost no part of the body that cannot be exercised effectively with one of Joe's designs.